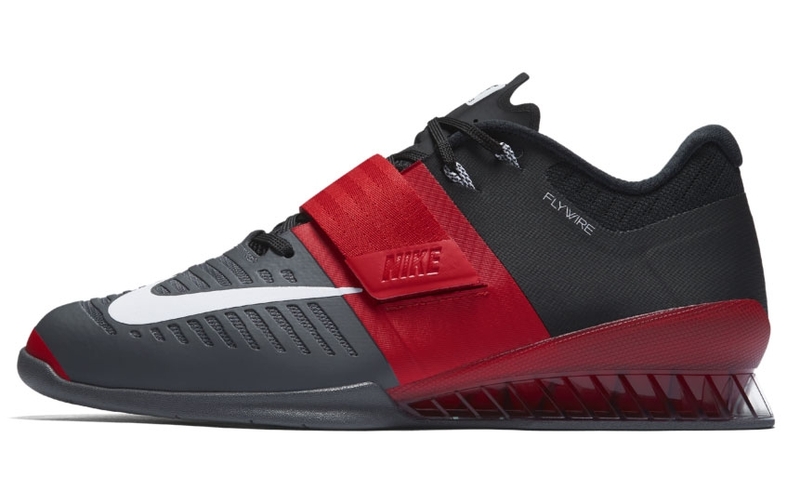 In the last two months we’ve written multiple articles about new lifting shoes being released. Whether it was Nike, Adidas, Reebok, or even NOBULL, there was always something new coming our way. It’s both exciting and fun to wait for your favorite brand’s new model, especially when the style matches your tastes. Lifting shoes support a more stable base and allow athletes to achieve greater depth in their squat/Olympic lifts. The elevated heel is what’s known for the extra squat depth. When the ankle has to dorsiflex less (because it’s on an elevated surface), then the body can achieve greater knee flexion. This results in a deeper and more comfortable squat position. Want to find the best weightlifting shoe for you? Take our weightlifting shoe quiz to find out which brand and model you should try! A lot of athletes overlook heel height in lifters, which can lead to shoes that may not benefit them to their best advantage. For this article, I’m going to discuss how to choose the right heel height for your body and squat style. Elevated heels come in a variety of options, but the standard heel is .75″. Some athletes add inserts to the bottom of their shoe to increase their heel above the general .75″. The primary goal of an elevated heel is to achieve ample squat depth with an upright torso. In regards to choosing your perfect heel, there are multiple factors you could look for including: leg length, torso length, and squat style. Leg and torso length are two keys to choosing the perfect lifter. Analyze your body and decide whether your legs and torso are shorter or longer (if you don’t know, ask a coach). Sometimes a lifter has a combination of both. Once you’ve done this, use the points below to help you choose. If you’re someone with longer shins and femurs, then you may benefit from .75″ or higher heel. It’s harder for someone with long legs to achieve the bottom position of the squat with an upright torso and no heel to sit back on. Lifters with short legs have it a little easier when trying to achieve optimal depth. They can sit back and keep their torso upright with less heel. If you know your shins and femurs are short, then start with a .75″ heel and adjust accordingly to your bottom squat position. Your torso angle is the cherry on top when choosing the perfect lifter. The perfect heel will allow full squat depth with an upright torso. A longer torso is more prone to forward lean, which can sabotage lifts. If you have a long torso with short legs, then you can get away with a shorter heel. Although, for lifters with both long torsos and legs, then they should look into a higher heeled shoe. The shorter a torso is, the easier it is to remain upright at full depth. For those with long legs and a shorter torsos, look for a taller heel. Lifters with both short torsos and legs have it easiest, and can typically work with a variety of heels. The table above can be used as a guide when assessing your torso and leg length. It’s important to keep in mind that everybody’s anthropometrics are slightly different. This chart may not match your body perfectly, even if you fall into a certain category. Use this as a guide when you begin your search so you have an idea of what you should look for. After anthropometrics have been assessed, it’s time to focus on squat style. The way we squat will also have an influence on the lifting shoe we’d benefit most with. Width of our stance plays a part, along with high-bar and low-bar style. A narrow, or quad dominant squat will benefit from lifting shoes with standard (.75″) or higher heels. In a narrow stance, typically a lifter’s knee and ankle flexion will be greater. This being said, often a higher heeled shoe for a lifter to sit back on will support this style of squat. A lifter using a wider stance will often place more emphasis into their hip flexion, which lessens knee/ankle flexion. It’s less imperative for a higher heel in this style of squat, so a lower heel can work just as well. A successful heavy high-bar squat relies on an upright torso to resist forward lean. An elevated heel can support the lifter’s ability to maintain optimal positioning through full range of motion. If you know you’re high-bar squatting frequently (primarily), then a heel can help benefit your lifting. This style squat relies more on the posterior portion of the body, especially at the hip joint. The bar is positioned on the back, so some forward lean is necessary for the completion of this squat. Knees and ankles typically don’t need as much flexion, so a lower heel can work much like with a wide stance. Use this table in addition with the above anthropometric chart to assess your perfect heel height. In reality it’s nearly impossible to prescribe a lifting shoe heel height without watching someone squat and assessing their mobility. Although, these above characteristics are great tools for lifters to gain insights into what type of heel will benefit them most. My advice is to try multiple shoes to find the perfect fit. If you don’t have a pair, ask to borrow someone’s, then perform a few squats similar to how you’d be lifting. At the bottom of one of your reps sit and hold the position. Take notes on your torso angle and comfort in full-depth, as these will be major predictors of successful/failed lifts. At the end of the day, the typical .75″ will work for a large portion of strength athlete. In most cases I’ve seen, athletes who struggle hitting full-depth with an upright torso have more of a mobility issue than heel height. Hi Jake, I appreciate your work on barbend, thank you ! The part concerning torso length concerned me a though, especially the one about shorter torsos having it easier than long ones. I believe it is the opposite (if a short and a long torso are angled the same way, the longer one will reach farther forward, so less forward lean necessary for the bar to be over mid foot). Also this has nothing to do with someone’s height. A tall person with short legs relative to his/her torso will still have it easier than someone of shorter stature with long legs relative to his/her torso. So there is no real ” short torso + short legs ” person or ” long torso + long legs”, this just means short or tall with “medium everything”. Anyway thank you for this blog, it’s always nice reading you or watching on yt. Cheers.